The first meeting of the Cosgrove Senior Citizens Club was held in the Victory Hall on Thursday April 13th 1972. Members were asked for a name for the club and from their suggestions it was decided to accept The Golden Hour. Those elected to form a committee were the following:- Mrs Olive Lambert (treasurer) Mrs P. Holman (secretary and leader) M. J. Lovesey, Mr B Cotton and Mr and Mrs Charlie Hill. Members could be from Cosgrove or from the area round about and this club was very popular. They had guest speakers, played cards and bingo and always had a lovely tea! Outings were organised, including mystery tours which went down very well, and visits to local places of interest, such as Woburn. A full Christmas lunch was always a high spot. On 29th May our members and friends enjoyed an evening coach trip, stopping at Passenham for an excellent buffet supper. At our monthly meeting on 13th June, members enjoyed the usual games of Bingo and Whist, and tea with sandwiches and home made cakes. On 17th June we enjoyed the sunshine at a coffee morning held in Mrs Holman’s garden while Radio Northampton was broadcasting from the Bridge. £10 was raised. because Cosgrove has been given some. Please give her your names. A Soup Lunch will be held at the home of Mr and Mrs Holman, Bridge View, on Tuesday 10th March from 12 o’clock onwards with a Bring and Buy Stall, Raffle etc., proceeds going to the Golden Hour Club. On Thursday 17th August, which was a very nice summer’s evening, a coach took approximately 22 over 60s on a Mystery Tour which started off through Milton Keynes towards Newport Pagnell, through Ampthill, Flitwick and many other very pretty Bedfordshire villages. We ended our trip at the Swan near Turvey where we were led into a private room with a bar and served, by very pleasant ladies of the Swan, with supper and coffee. To end the evening Cynthia Smith led a Sing Song of some old favourites. A very good time was had by all. On 13th December another wonderful Christmas Party was prepared by Phyllis, Olive and Ruby. Thanks also to the few friends who gave trifles etc. and donations towards such a lovely meal. It seems to get better each year. After the cake had been cut and wine served we were all presented with two Christmas parcels each and I think we have to thank Ted for some of them. We were all pleased to see Ruby back as she has worked so hard for many years. The only sad note is that it will be our last party in our good old Victory Hall which most of us worked hard for over the years since it was built, but I suppose it is “Progress”. The Club has had quite a good year. We have had good monthly meetings with the usual Whist and Bingo followed by a good afternoon tea. Two very good coach trips stopping for tea in Bedford on one and a Buffet Supper in Yardley Hastings on the other, which everyone enjoyed. We once again had a very successful Christmas Whist Drive, raising £207 for Club funds. We would like to thank everyone for the gifts of prizes and donations given which makes this such a success. Our thanks to Olive Johnson for her help in this event. At our meeting on 16th we had a very nice dinner as well as a glass of Sherry to celebrate the 20th anniversary of the Club. Ted Lambert produced the original register of the very first meeting which proved very interesting and nostalgic. We then continued with our usual Bingo and Whist followed by tea. Thank you Olive and Phyllis for a very enjoyable afternoon and to Ted for doing all the washing up. The Golden Hour Club had quite a good 1992. 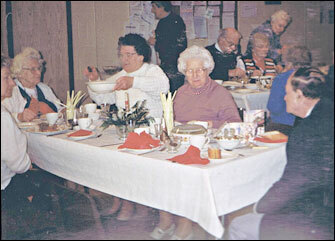 We had our usual monthly meetings with Bingo and Whist and two good lunches at Easter and in the autumn. At Christmas we had a hot lunch with all the timmings. In the afternoon we were pleased to welcome Derek Taylor who played the organ with Christmas songs and dances. On Tuesday 13th September we had a coach trip around the beautiful villages towards Daventry, then on to Manor Farm, Whilton, where we visited the farm museum. What a surprise we got on entering the barn adjoining the house for tea! We not only had a delicious tea with all home made cakes, but were entertained by various organs, pianola and even handbells, situated around the room amongst other objects, collected over the years by our very talented family hosts. We all had a wonderful afternoon and feel it is well worth another visit. And wasn’t Phyllis clever to change the day to Tuesday from our usual Thursday  we had sunshine all the way! 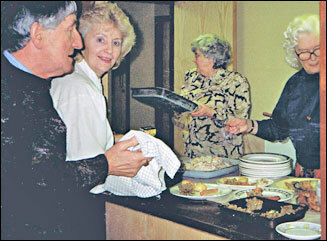 The Golden Hour Club ceased shortly after this through lack of members  younger over 60s preferring to stay with other clubs in the village.